I decided about a year ago to step it up to what I feel is THE BEST charcoal grill on the market today. It’s the Weber 22 Inch Charcoal Grill that checks all of the boxes for me! I’ve been through the gamut of Weber charcoal grills through the years and use all of the Weber grills that I own. I love my Weber Smokey Joe and my Weber 18 inch One Touch Silver and still use them on a regular basis. Almost exactly a year ago I created a youTube video of me unboxing and assembling the Weber 22 Inch Charcoal Grill that has been widely viewed (4.7K Views as of 4/25/2018). 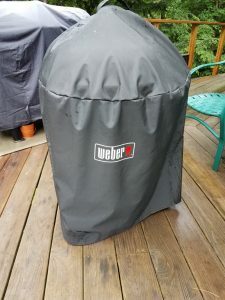 I really wanted to help others set up their own Weber 22″ Charcoal Grill because I love mine so much! You can check it out below. Since then I have used this Weber grill extensively for my charcoal grilling needs. Needless to say I love it and recommend it highly as the best charcoal grill that you can buy if you love to grill with charcoal as I do. 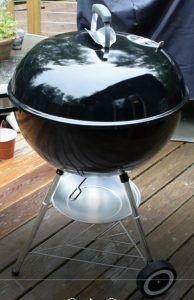 So what is so great about the Weber 22 Inch Charcoal Kettle Grill? If you are only grilling for you and your spouse or if you are grilling for a crowd the Weber 22 Inch Charcoal Kettle Grill is perfect for your needs. I’ve found that the cooking surface is just the right size and allows you the flexibility that you need. 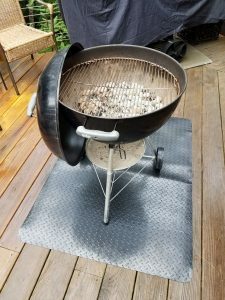 Believe me, I loved my Weber 18″ One Touch Silver Grill and still use it to this day BUT you simply cannot purchase all of the accessories that you can purchase with the Weber 22 Inch Kettle Grill. You can buy the Weber BBQ System which includes a Weber Gourmet Sear Grate. You can also pick up the Weber Hinged Cooking Grate which allows you to add smoke wood or more charcoal to a hot grill. You can also enhance it with the Weber Charcoal Kettle Grill Rotisserie which I have not yet purchased but am considering it. The reviews are high for this accessory so it’s certainly a tempting purchase. 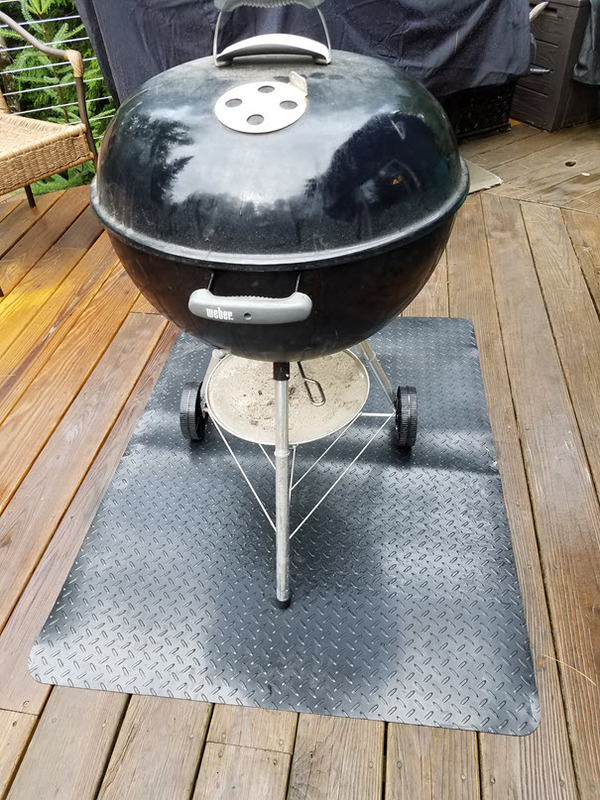 I’ve had my Weber 22” Charcoal Kettle Grill for about a year now and it shows no signs of wear or rusting. I do make it a point to cover it with a grill cover made specifically for this unit so I try to ensure that it lasts for a good long time. I’ve owned enough Weber grills over the years to know that they are well-built and last a good long time. If you grill on a wooden deck, you don’t want a grill that is too large. This one is a perfect footprint and the fact it is on wheels allows you to move it around easily when you are done using it. I keep mine under an overhang when I am not using it so it is out-of-the-way and doesn’t get in the way when you are using the deck when not grilling. I used to own a propane grill but with propane you always have to worry about shutting it off after using it and, to be honest, you are using flammable gas to cook your food. 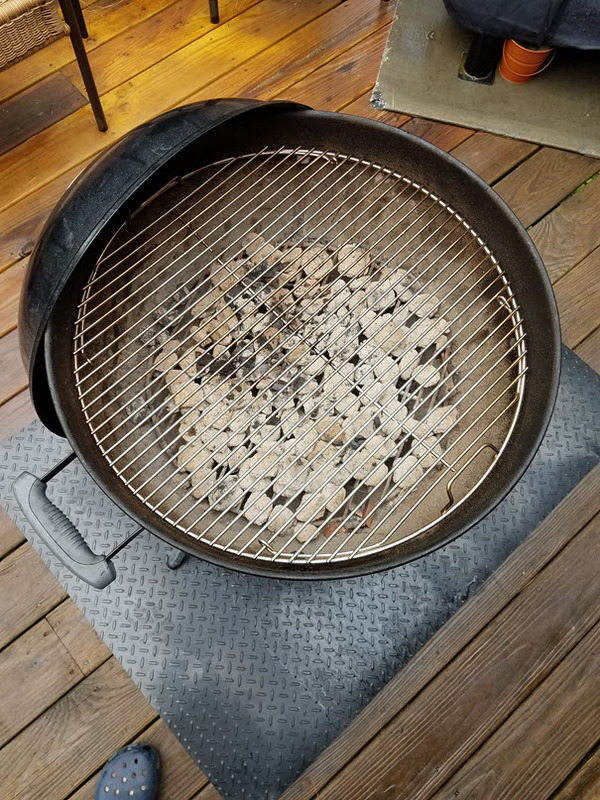 Charcoal isn’t perfectly safe but if you keep it on a flame-resistant protective mat while on a wooden deck, shut down the vents when you are done grilling, and just be vigilant of any embers that may fall from the grill, it is a safer alternative to a propane grill for sure. Images of the Best Charcoal Grill! If you too want to make the leap to what I consider is the best charcoal grill on the market today, the choice of the Weber 22″ Charcoal Kettle Grill is probably the best decision you could make. It's reasonably-priced and delivers as advertised! If you have any comments please leave them below or contact me directly using my Contact Me page. I love your Blog! I like the structure and how great you explain things to the bone, about barbecue grills! I also have a great Blog that is all about barbecue… I wonder if the video from that you use on Youtube is a review you did by yourself or just a random one? Anything on my youTube channel was done by me. Thanks for your compliment. I’ll check out your site.